My best iphone photos for the month of August 2013. I was looking at the photos I have taken using my iPhone 4s in the month of August 2013 and I think these two are the best of the month. 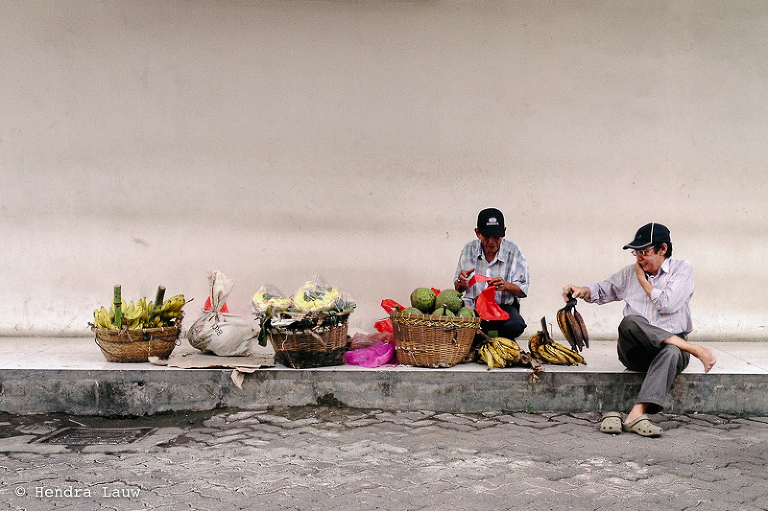 The first one above was shot at Pasar Puri, Jakarta. The man on the phone was talking to someone, explaining about the banana that he was probably tasked to buy. He quoted the price given to him to the other party on the phone and I think he was told that the price was too high and then told the seller so. It was a little comical when I watched the scene and heard the conversation. It reminded me of myself when my wife asked me to buy vegetable in the market. I would usually call her once I have the vegetable in my hands, explaining how it looks like before making the purchase, to make sure that I would get the right one. The other photo below is kinda special and personal. It was a self-family portrait shot in a lift, at the corner of it, when I was on my way to surprise my wife with a birthday lunch attended by her big family, which she had no clue yet. The mirrors at the corner of the lift created the effect.